Discover how Quest Diagnostics can support all of your practice, patient, and financial management needs by connecting you to more than 470,000 clinicians nationwide. Type your User ID and Password, and then click on Log In. If you have forgotten your User ID or Password, click the Forgot User ID or Reset Password? link. Reminder: Password is case-sensitive. Forgot User ID or Reset Password? This system is restricted solely to authorized users and may be monitored for administrative and security reasons. The user expressly consents to such monitoring. Any use of this system must be in compliance with Quest Diagnostics policies and applicable laws. Unauthorized users or any unauthorized use may subject the user to criminal and civil penalties under state, federal, or other applicable domestic and foreign laws. This complete EHR is ONC 2014/2015 Edition compliant and has been certified by ICSA Labs (ONC-ACB) and Drummond Group (ONC-ACB), in accordance with the applicable certification criteria adopted by the Secretary of Health and Human Services. This certification does not represent an endorsement by the U.S. Department of Health and Human Services. For more CMS EHR Certification information, click here. Any additional types of costs: None. Quest, Quest Diagnostics, the associated logo, Nichols Institute and all associated Quest Diagnostics marks are the registered trademarks of Quest Diagnostics. All third party marks  '�' and ''  are the property of their respective owners. � 2000-2019 Quest Diagnostics Incorporated. All rights reserved. CPT� copyright 2018 American Medical Association. All rights reserved. Fee schedules, relative value units, conversion factors and/or related components are not assigned by the AMA, are not part of CPT�, and the AMA is not recommending their use. The AMA does not directly or indirectly practice medicine or dispense medical services. The AMA assumes no liability for data contained or not contained herein. CPT� is a registered trademark of the American Medical Association. Applicable FARS/DFARS Restrictions Apply to Government Use. U.S. Government Rights. This product includes CPT� which is commercial technical data, which was developed exclusively at private expense by the American Medical Association (AMA), 330 North Wabash Avenue, Chicago, Illinois 60611. The AMA does not agree to license CPT� to the Federal Government based on the license in FAR 52.227-14 (Data Rights - General) and DFARS 252.227-7015 (Technical Data - Commercial Items) or any other license provision. The AMA reserves all rights to approve any license with any Federal agency. Your web browser will not be supported in the near future. Using an outdated web browser could cause a security risk and limit Quanum functionality. For optimal performance, please upgrade your web browser now. 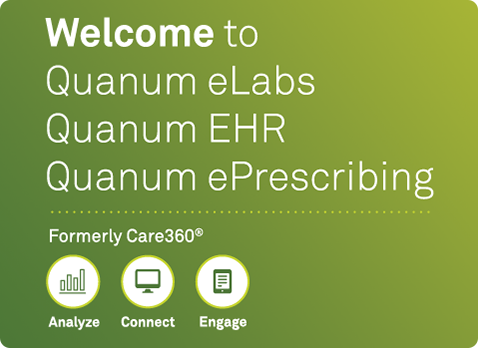 With Quanum HD, you can initiate lab orders, receive and view new lab results, mark reports as reviewed and add annotations to the report anytime, anywhere. Find Care360 HD or Quanum HD in the App Store. Did you know that you can use your iPad to access Quanum?